Editable - Edit Your PDF Forms In MS Excel! Easily - Convert PDF To Excel Document Just In Only 3 Clicks. Fast - New PDF To Excel Converter conversion engine, 160% faster than other Converter. Page Range - Convert Selected Pages of PDF document To Excel format. Batch Mode - Convert HUNDREDS of PDF Files to Excel XLS at One Time. Convert PDF To Excel Now! - Convert PDF to Excel XLS format, you can edit PDF forms in MS Excel. - PDF To Excel Converter can convert PDF to Excel without Microsoft Excel installed. - PDF To Excel Converter will not only convert forms, but also keep all PDF text into Excel result file. 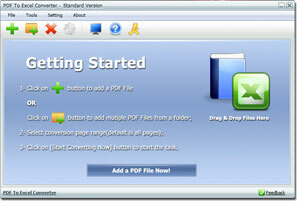 - With PDF To Excel Converter, you can convert PDF to Excel in only 3 Clicks. 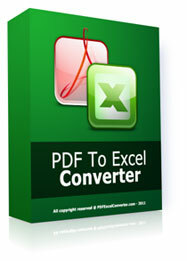 - PDF To Excel Converter conversion engine is 160% faster than other PDF converters. - You can convert hundreds of PDF documents to Excel XLS files with batch mode. You may get a lot of tables in PDF files need to be converted to XLS/Excel format, which could be used and edited much easier. 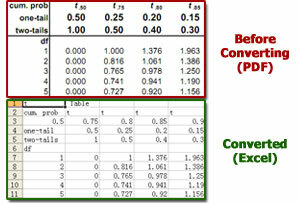 PDF To Excel Converter is the proper program allows you to convert PDF tables into Excel files. Once the file is converted, all the content of tables could be edited immediately in MS Excel. Then you could make statistics, draw graphics, create reports in MS Excel for the data extracted from the PDF document. The speed of the PDF to Excel conversion is quite fast due to the built-in auto data analysing engine. Batch Mode - 100 PDF files can be converted at one time. No Excel Required - Even if you have not installed MS Office / Excel program on your computer, the converter program could work smoothly still. Speed ​​- the program works much faster than other PDF to XLS converter applications and it will save valuable time. It is easy to get started with the converter, and there are only a few steps to follow. The first is to download the PDF To Excel Converter to your laptop or desktop computer. The installation will take a very short time and then you will be able to convert PDF files very soon. - Please double-click on the PDF To Excel Converter icon on your desktop, or start it from the start menu. You will see the text "Getting Started" on the main window and please click on the "add a PDF file Mow" button. - Click the "Add" button and select a PDF file, or drag and drop your PDF files onto the file list directly. - Click the Browse button to set the output folder, which will store the converted XLS files. - Now you can start the converting task. Click on the "Convert Now" button the conversion will begin immediately. The conversion will only take a few minutes. You might find some slight differences between the converted XLS file and the original PDF document. Each column and line will be analyzed, but some PDF forms / tables have complex structures and are not easy to be analysed. However, most of PDF documents could be converted very well. PDF To Excel Converter supports page range selection, which means users can convert selected form pages from a big PDF file, and it will save much more time than converting the whole PDF file. Also, PDF To Excel Converter has the Batch Mode to convert hundreds of PDF documents to Excel XLS files at one time. PDF To Excel Converter doesn't require Microsoft Excel installed.